I happened across a Bosch flexiclick around the black friday season. It is a 12V driver with interchangeable heads; offset, hex driver, and regular 3/8″ chuck. Any of the 3 can go on a right angle attachment. It is pretty genius. I have owned their pocket driver for a few years and love it to death. I liked it so much I built it a portable caddy a while back. This new driver needs a home too. I started by imaging a few things I wanted to make prints for on top of my cutting mat. It provides a good grid reference when making things in CAD. That usually gets you a 90% solution. 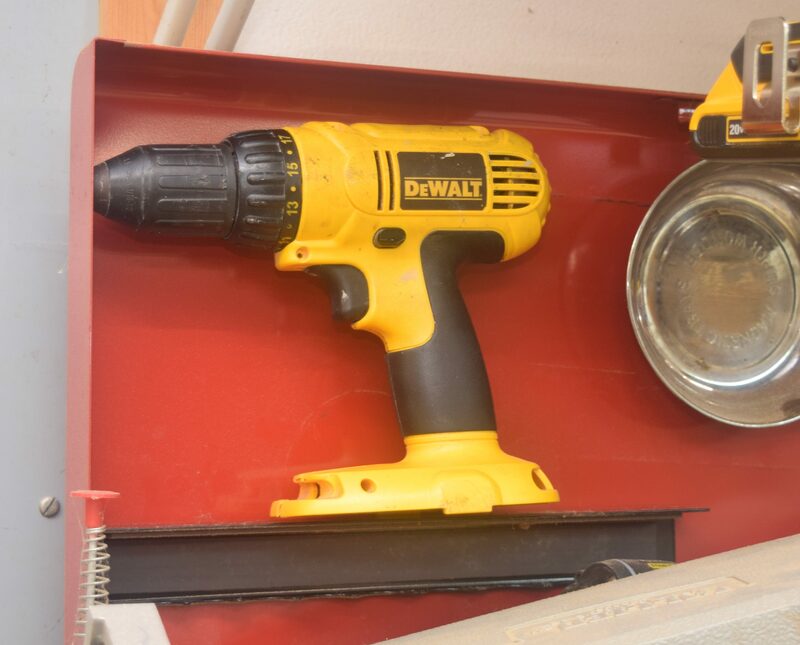 The drill body will need a holder and the charger has no wall mount ability. Usually they have some key holes in the bottom to let you hang them from a screw. I have a wall section with a french cleat so I arranged all the holders until I got a compact layout. Here are all the printed parts screwed down on a scrap board. Starting off at the top is a plate that holds the charger. It is shaped like the charger with a channel underneath to allow a zip tie to pass through and hold it down. A cleat on the bottom keeps it from slipping down. The one zip tie wrap has been sufficient in holding it down with battery connects/disconnects. The drill body has a nub sticking out where the various heads are removed. I used that to provide a good lock in mechanism. It is sturdy enough to have not fallen off yet, but is easy to plug in and out. The bottom bent section has some flex to it which is part of the magic. The battery holder is not my design, Thingiverse link to the original designer. Last but not least is the tray that holds the flexiclick heads. The right angle and offset attachments have a high enough center of mass that they need a little helper support to keep them from toppling over. I bundled my three original designs and uploaded them as a group to Thingiverse. All together fully populated and with the wires bundled up, it looks like a nice drill station. I had room left over so I stuck a Ryobi charger on there for good measure. If I were to do a review of this tool I would say it is good but would have been a lot better if it were brushless. Trying to mix this many functions together always results in some compromises. Still, I use it for small light drilling quite often, and the offset driver has gotten me out of a bind. It is time for a changing of the guard. 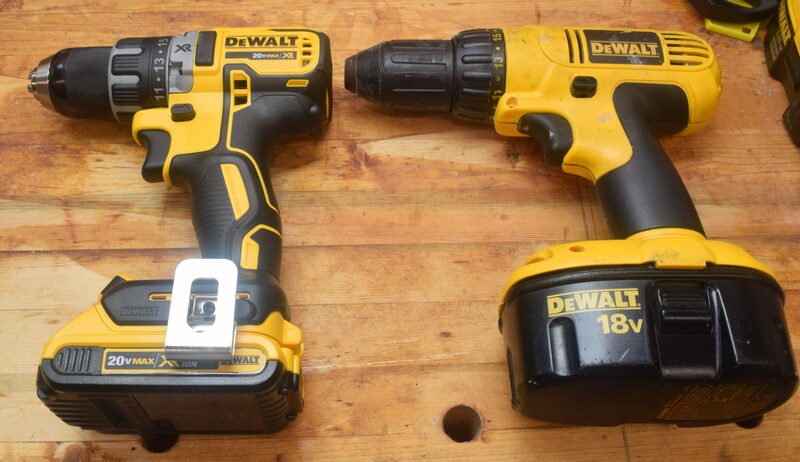 My dad bought me my first Dewalt drill when I was still in school. It is has been almost 10 years and the drill served me well. I replaced the motor over a year ago, but the gearbox and chuck were starting to give me issues. I was ok with nursing it along until a bit of a deal came my way. 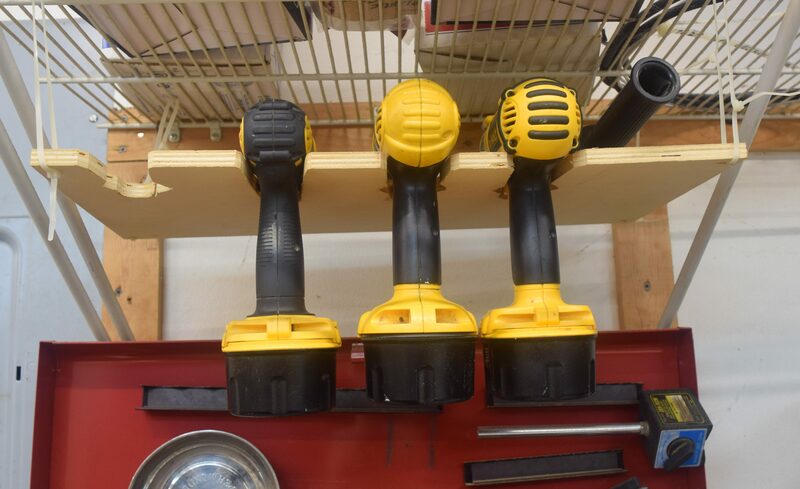 Lowes was getting rid of a brushless 20V hammer drill with batteries. It was a display model and lacks accessories and a charger, but was still a complete steal! My hammer drill wasn’t in bad shape, but the cost was less than I could buy the batteries alone for. I had to do it! After a few weeks of using the new drill I was hooked. Fast, light and very powerful! It is like when you make a clean spot, then realize you need to clean everything. 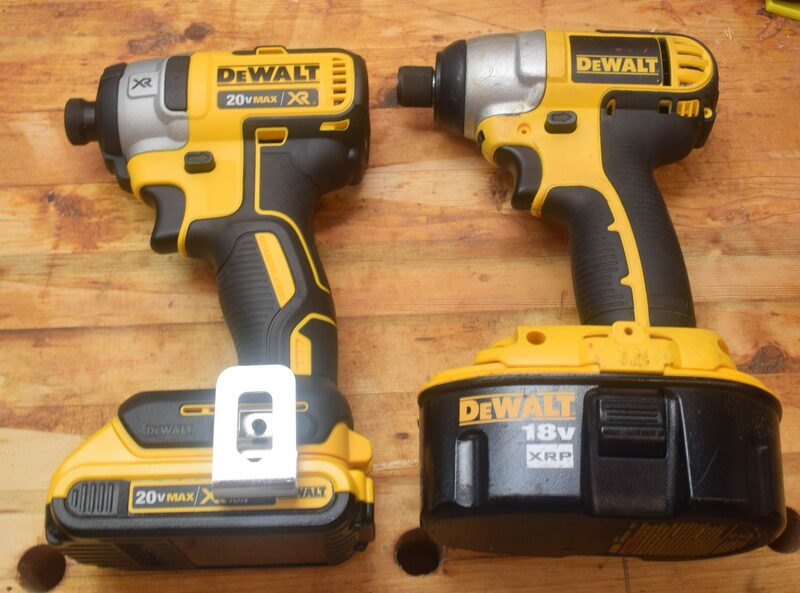 I had to replace my ailing drill/driver, but seeing the capability of the new tools meant I really wanted a new impact driver too. Black Friday swept through and provided me with a reasonably opportunity for both. I am in building DIY heaven! Now that I have a complete set of new everything running on 20V, lets zip through the various plusses and new features. The tools feel incredibly light and well balanced compared to the old ones. This is surprising considering that with the exception of the hammer drill (it lost 10 ounces), they weigh within an ounce of the old ones. Mostly that comes from the batteries. They go from over 2 pounds each to 3/4 of a pound per. Despite the weight loss they have a similar energy capacity to the old XRP batteries. That should go further with the brushless motors. Without opening them up it is hard to say if they have traded a lot of metal for plastic. The chuck for the drill/driver got more compact and went all metal which is good. The hammer drill auxiliary handle went all plastic. Not great, but I don’t use it often. If they got smaller, but kept the same weight, then it would seem they are denser. Maybe they have denser packaging or the motors are heavier. Hard to say unless you took both sets apparent and compared, but they certainly don’t feel cheaper. Aside from the brushless motors, everything got nice lighting. 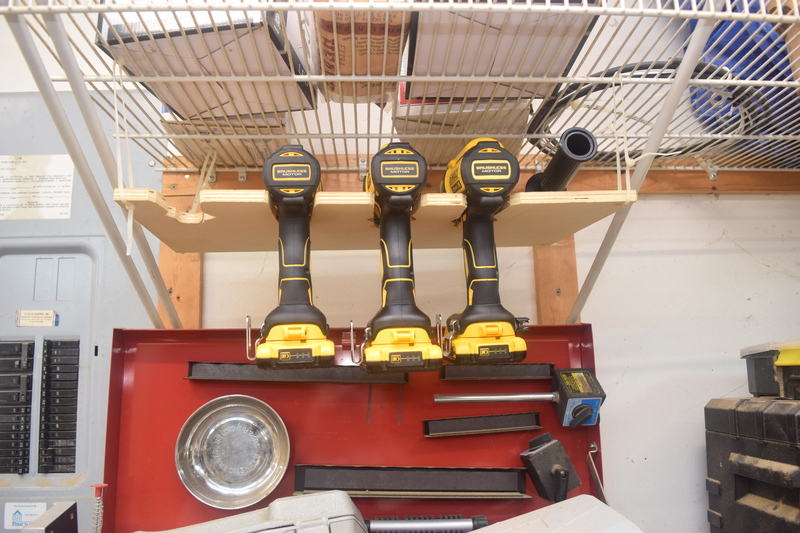 The drill driver even has brightness options and a 20 minute light timer if desired. Good for working in dark tight spots. They all have heavy rubber pads on their sides. When you lay them down they sit on these pads. Good for when they get knocked over, and to prevent scratches and sliding. Each one also has a built in belt hook clip. They go well on belts or pants pockets. Very handy when climbing ladders and such. The chucks have a small hexed section for tightening/un-tightening with a wrench. 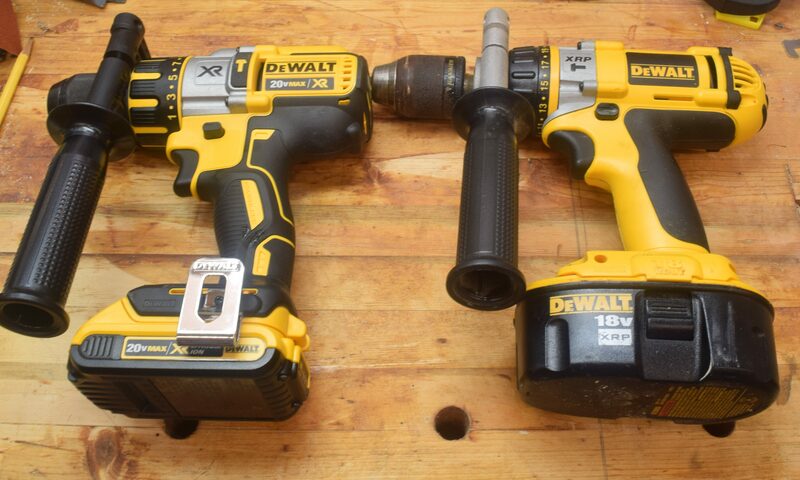 Last but not least, the impact driver now has 3 speed/torque settings. You can gently install or remove screws from soft delicate structures, or really punch home a long bolt. Enough gushing about my new toys, they still are going to spend a lot of their life sitting around. As it turns out, they fit perfectly in the hanging rack where my old ones went. Most of the old tools and batteries are going to friends and family. The drill isn’t much use to anyone, and I wanted to keep it. My dad gave it to me, and it was kind of my first real tool. I hot glued some magnetic stripping across the back and used some other magnetic brackets to prop it up in my toolbox lid. Kind of a trophy or memorial to a great tool. I did a lot of work with that thing! Maybe I will get around to mounting it on a real plaque someday.